The Ridiculous Rocket Space Prize - Space for All - In addition to the Ridiculous Rocket Space Prize Facebook event page linked there, there is also a RidiculousRocket Facebook page celebrating the SLS in all of its grandeur. 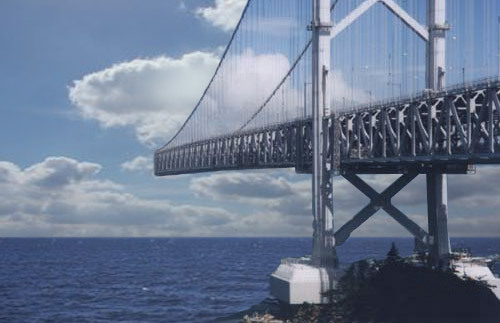 The image that occurs to me is something like this, but Photoshopped with mighty, if a bit waterlogged and immobile, SLS rockets replacing the columns holding up the bridge. Or maybe the columns are replaced by barnacle-covered SLS boosters and the road is the SLS core having a rest. I'm sure someone with graphics art talent and too much free time could do justice to this goofy image. CubeSats get big - The Space Review - The Nanosatellite Launch Challenge is featured in the article.